These personalised baby t-shirt’s are coming soon and are not available for sale at the moment. 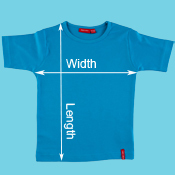 Baby T-Shirt’s are personalised on the front with a selection from our slogans or your own slogan (three short lines approximately 25 letters). We are located in Sydney, NSW. This personalised baby’s T Shirt will be posted through Australia Post within 5 working days.